Helping some local señoras capture a wild bee colony that was living in a coco tree. The honeycomb in this hive was three feet long! And since we’re talking bees, here are 15 fun facts about them! It takes the 6-week lifetime of a single worker bee to produce 1/12th of a teaspoon of honey. 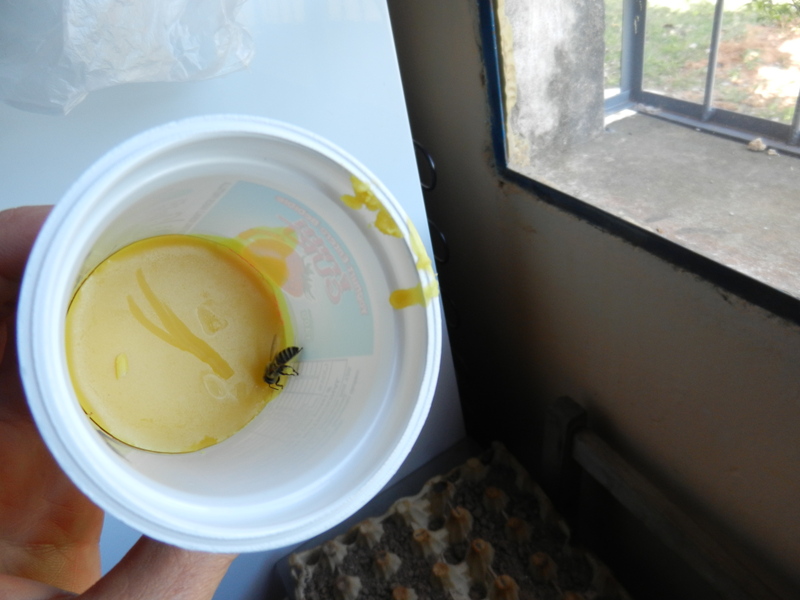 This honeybee found a container of beeswax lipbalm that I made. Here she is stealing it! First, she scrapes the wax from the top with her mouth, then pats it into shape with her front legs. Then she passes the ball of wax from her front feet to her middle feet which pack it into her pollen baskets on the hind legs. She was so heavy with wax that had trouble flying away! A single bee can visit up to 2000 flowers a day. This means they are POLLINATING your future food supply and those pretty flowers you like to display on your table and around your home. No bees=no food for you. Think about it. 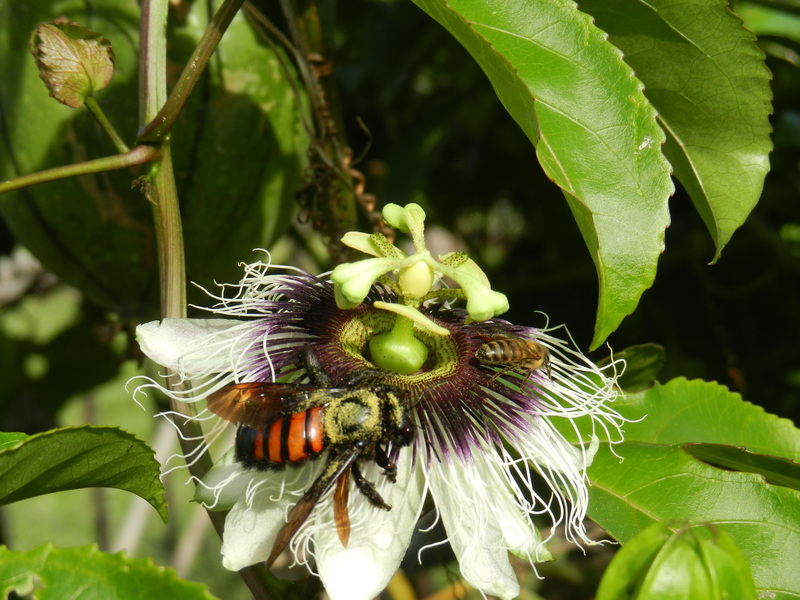 Passion fruit flower with a giant bee collecting nectar. You can see all the pollen on her back, which is great for cross-pollinating flowers! This giant bee is very docile and stingless. On the backside of the flower behind the stamens you can see a smaller, common honeybee. The two get along just dandy. No more tomatoes or pasta sauce or pizza! Bees must flap their wings 12,000 times a minute to stay aloft when returning to the hive with a full load of pollen. That pollen is HEAVY. There are up to 60,000 bees in a hive and they maintain the hive at a constant 93 degrees F.
Bees are ‘born’ out of the comb full-sized and immediately begin to work. There is only one queen bee per hive. If two or more queens are in the same hive they will fight to the death. The colony can make a new queen at any time by simply choosing any egg and feeding it royal jelly instead of a regular bee larva diet. The queen cell is easy to detect as it is much larger than a regular cell. Once ‘born’ the new queen will immediately know if there is another queen present by the smell of her pheromones and the fighting will begin. The queen is the mother of all bees in a hive and can live 3-4 years. Her purpose is to lay eggs and give off pheromones that keep the other females sterile and also indicate her presence, which is comforting to the workers in the various messages it relays. She can lay up to 1500 eggs per day or nearly a million in her lifetime. The queen is significantly larger than all other bees in the hive. She leaves the hive only once and that is only to mate shortly after she is ‘born’. She stores a lifetime of sperm in her body. The only other time she exits the hive is if it is disturbed (during a honey harvest or hive renovation) but she normally returns quickly. 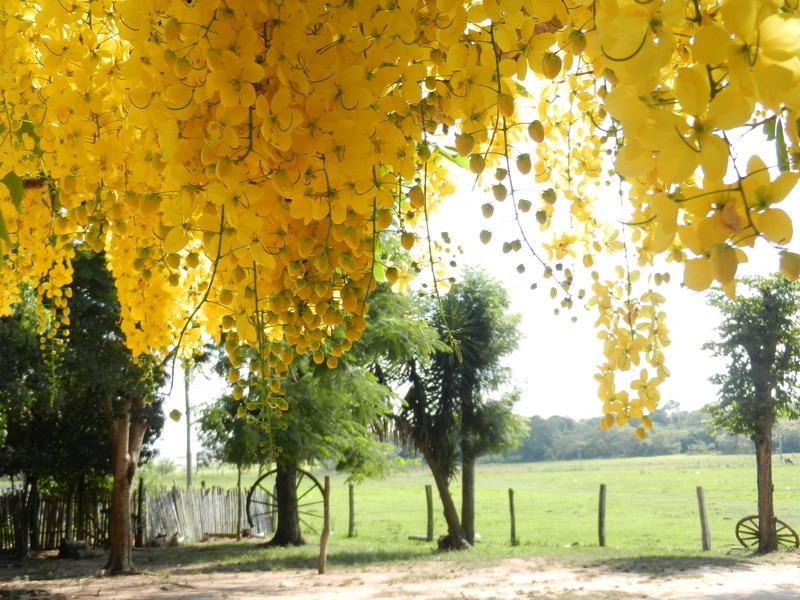 Illuvia de Oro tree (Rain of Gold) last summer, pollinated by, you guessed it, BEES. The majority of bees in the hive are females, all sisters, and all work tirelessly. They have different roles based on their age. The newest bees tend the queen, grooming and feeding her; older bees collect pollen and nectar and will evaporate nectar to make honey; they defend the hive as needed, tend the brood and young drones, build the honeycomb, etc. Drones are males that make up a small percentage of the hive. Their sole purpose is to breed with a queen – but not their own! – and they die immediately after mating. They do not have stingers and are unable to defend the hive. Essentially they hang out cruising the local environment for queens and eating the hive’s food supply. They do no other work, not even helping collect pollen or nectar. Nothing. In preparation for winter, the female worker bees often kill off many drones to save the food supply for the working females, queen and brood and then they push the drone bodies out the front door (I’m not kidding). Bees must produce 60 lbs of honey to sustain the colony through the winter. Honeybees produce beeswax from slits in their bodies. They chew these flakes to make them soft then pat them into place to make honeycomb cells. Every cell is an exact replicate of every other 6-sided cell. Honey harvest! 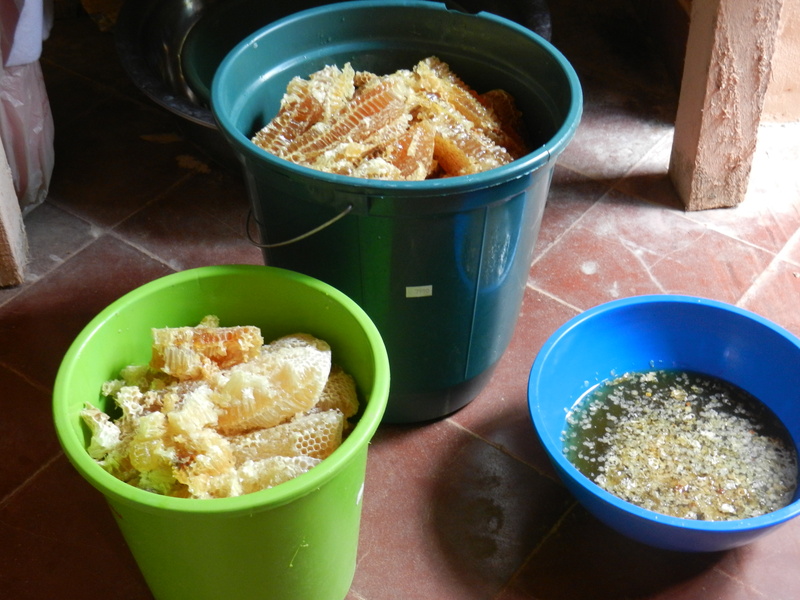 Buckets of fresh, beautiful, delicious honeycomb and honey made from jasmine flowers…the best I’ve ever tasted! When bees make honey from nectar, they fan their wings over the nectar to evaporate the water. Cured Honey is 17% water. When honey contains more water than that, it ferments at room temperature. 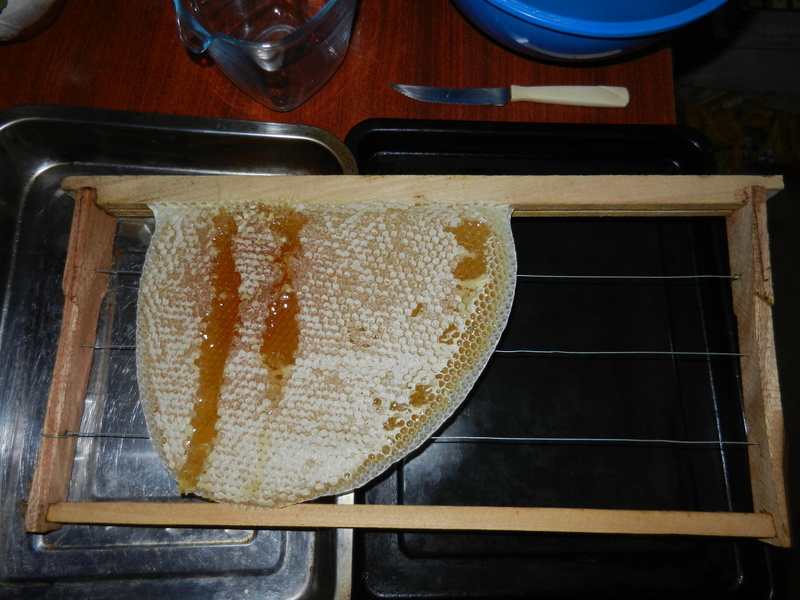 When harvesting honey you want to look for the capped comb (the cells will be covered with wax- see photo below as an example) which indicates the honey has been cured and can be stored at room temperature indefinitely. Honey is the only food that doesn’t spoil (as long as no contaminants are introduced) and has been found buried with pharaohs in the Egyptian pyramids and … still edible. Honey is also a great preservative as its high-sugar, low-oxygen content do not allow generally growth of bacteria. Sometimes honey forms sugar crystals due to contact with air but this does not change the quality of the honey. To return to liquid simply place the jar in a pan of warm water until liquefied. Do not boil as this destroys many of honey’s beneficial properties. *Try a google search for some of honey’s amazing uses and benefits including for swelling and pain from bee stings, cuts and burns, acne, dry skin, hair conditioner, allergies, and more. Without healthy populations of bees our world would become a disastrous (and hungry!!) place. Do your part to help support bees in your area. Avoid use of pesticides. Educate yourself about these amazing creatures. Do not kill honeybees. Remember they only sting when threatened. They will not hurt you unless you look scary (too close to the hive or wearing dark colors), act scary (swat at them or mess with their babies or queen) or otherwise piss them off. If you need a swarm or nest removed call your local beekeepers association. There are always beekeepers looking to capture a hive and take it home. They will love you for it. 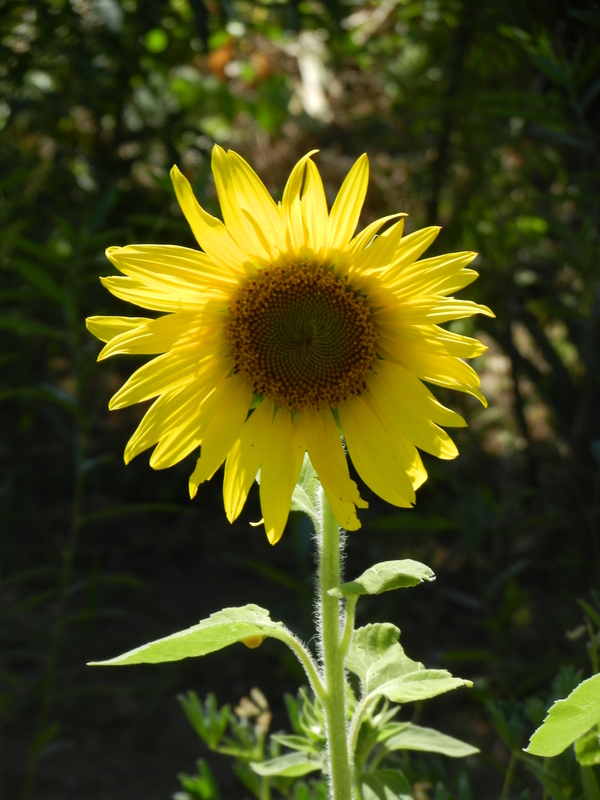 All things thrive when bees are alive! It started off as a quiet walk toward the lonely end of town. A little exercise, a bit o’ fresh air, wide open prairie space to clear my thoughts after a trying week. Part-way, a family of kids (pre-school through high school) paused me into conversation and jumped at the invitation to join me. We talked animatedly about the week’s events and when the oldest asked me to teach her English, the group begged to start, right then. We spent the final half mile learning the English equivalent to every color and object they saw. My walk ended with a new group of very enthusiastic English students and a wide grin on my face. Payback for stealing honey. I think my watch was acting as a tourniquet, keeping the swelling out of my hand. Our mission was cut short but I did manage to steal a bit ‘o honey and that night we squeezed it from the comb so she could take it home with her. The same afternoon we killed a four-foot snake in my front yard. After surviving all this with such grace and aplomb, she will clearly make a terrific volunteer and Paraguay is lucky to have her. Falsa jarara or toad-eating snake. Kinda feel bad for killing this one but it’s so similar to the deadly kind we couldn’t take a chance. It was right outside my front, at a school no less! 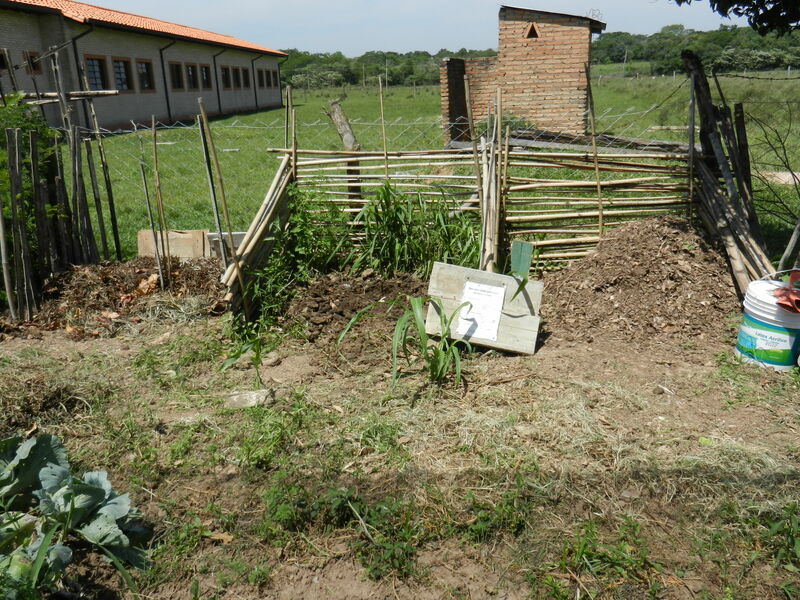 Speaking of compost piles, this past week I held a workshop to teach my community to make compost piles and compost tea. We talked about the difference between organic materials (leaves, veggie peelings, etc) and non-organic materials (plastic, metal, glass, etc) because they are considered one and the same here so it was necessary to emphasize what belongs in compost and what DOESN’T. But the real winner of the day was the compost tea because I had living proof of its effectiveness. I had two rows of basil, all planted at the same time. One had received treatments of compost tea, the other had not. 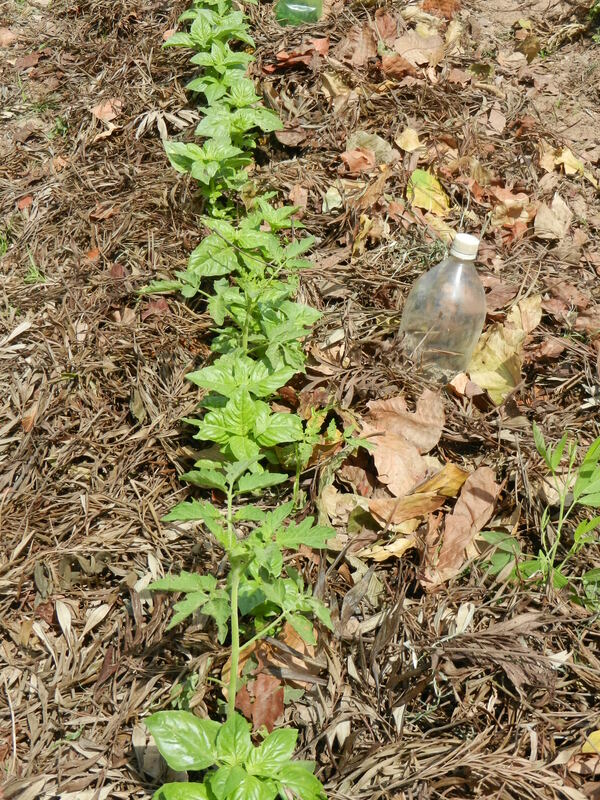 The compost tea basil was up to four times larger and they were sold. Also, because I like to encourage attendance at these workshops, I often use incentives like awarding Certificates of Completion (which are wildly popular here and held in high regard). This day I thought I’d be clever and offer free basil plants (because I had waaaaay more than I needed!) At first people took them but quickly turned around and brought them back saying “I’ve got some at my house”. Now, I might never know if this is actually true or if it’s just their non-confrontational way of saying they don’t like that particular variety of basil, kind of like when they don’t want to eat a food… they won’t say “No thank you. I don’t want any.” Instead they say “I don’t know how to eat that.” Overall, it was a good day, I’ve got lots of visits to people who want to make compost at home (Yay! ), and still looking for homes for several dozen basil plants. Abonera or compost bins. (Left) new pile started, (middle) old pile of straight cow manure now ready for the garden, (right) 2 month old pile almost ready for the garden. The white bucket on right is compost tea! I love how sometimes life really wakes us up when we’ve become blind to the everydayness of the things around us and the routines we make, how it shakes us to the core, and reminds us what a freaking miracle it is to be granted yet another day and host of experiences and adventures. I was stopped in my tracks the other day during a bus ride home from the next town. I grabbed the first available seat and turned to actually look at my neighbor to say hello and froze. He was the spitting image of my late grandfather, my mom’s dad. He had the same small, slightly stooped frame, bony face and big ears, white hair in the same pattern on a head of the same shape, the same royal blue colored shirt, large hands in his lap rising occasionally to wipe the drool from his chin and kind, kind eyes. Those eyes. I engaged him in conversation just so he would look at me with those eyes. I had to see if they were blue. I couldn’t tell from the sparkle so I asked him and he said they were black. But boy, if ever there was a spitting image of my beloved grandfather, he was it. Eventually I had to turn away as my own eyes welled up with tears, thinking about and missing this man I had loved so dearly and thinking how funny life is to give me such a stark reminder of him on a continent he had never visited. I’m overwhelmed and in awe at the magical ways of the universe. This one got me in the gut. There are few certainties in life but one thing is certain: Paraguay is never boring! Chickens follow free-ranging pigs waiting for fresh manure then pick out and eat the undigested corn kernels found in it. What’s the fastest way to jump start your morning? Awaken a hive of 40,000 killer bees! The Dustbowl of 2013: I’m writing on a Thursday with the promise from neighbors that it will rain tomorrow. The village is very excited. Storm clouds gathered tonight at sunset and the wind picked up. It was suffocatingly hot today, 103 degrees, and like breathing through a warm wet blanket. Even at 10pm the fans (ventiladores in Spanish) are earning their keep and relief is finally coming with the wind whipping ahead of the storm, cooling temps a bit and keeping mosquitos at bay. The power falters repeatedly. The Professor, with his connections, arranged for a tank of water to be delivered today and filled the well higher than I’ve ever seen it. I wanted to do a happy dance. No laundry in the rio afterall and the continued assurance of daily bucket baths and clean drinking water. A couple weeks ago I made my way to Asuncion, PY’s capitol. I had business and errands at the Peace Corps office and needed a little time away from the campo. I called a nearby volunteer who also lives in the Department of , and is my favorite traveling companion. Lucky Sagittarius that he is, this Kentucky mountain man with the preacher’s hat is a people magnet who casually turns any mishap into the best adventure. He agreed some time in the big city would do him good after a rough week. My one hour walk to the bus stop entailed watching ominous clouds gather, sure that it wouldn’t possibly rain TODAY, since it hadn’t rained in two weeks. Rain it did but, with impeccable timing, held off until the exact second I reached the awning of the bus stop. Then it poured. And the wind picked up and made it impossible to stay if I wanted to maintain any dryness. I ran across the street to a beautiful overgrown bush resembling a giant Easter lily with yellow trumpet-shaped flowers which provided fantastic shelter as I hovered under it, crouching over my backpack and the laptop hidden within to keep them dry. The rain lasted only 10 minutes but it gave me time to pause and be present. With my head bowed I watched the water collecting on my curls, slowly sliding, gathering, building into droplets as they slipped toward the ends, like kids on a waterslide, then gracefully fall onto my ankles. My ankles were quickly speckled with dust and raindrops. I lifted my foot outward into the rain hoping to wash off the dust. When the rain subsided I tried rinsing my feet in a shallow sidewalk puddle. Stupid. Before the rain, the sidewalk was dirtier than my feet from the road dust. It was essentially a warm, watery puddle of mud. Shortly thereafter the bus arrived and took me through new parts of prairie, past plantation after plantation of pines and eucalyptus trees and others I didn’t recognize, all standing in perfect formation like obedient soldiers. The tallest had foliage only at the very top and reminded me of giant rows of harp strings with cattle grazing beneath and between. We continued for two hours down this never-ending bouncy dirt road where the prairie stretched to an endless horizon, reminding me of the ocean back home, then closed in and became familiar smaller pastures like you’d find in any quaint New England country town. The smells of rain, rotting fruit, manure, and the bus’ ancient vinyl and polyester seats filled my head. The road became ugly as the rainstorm made friends with the clay soil and played games with the wheels on the bus. One moment we’re slip-sliding down a small hill and the next spinning our wheels at the slightest incline. It was a bit harrowing so I did what any logical person would do: went to sleep. In Yuty (pronounced joo-tu), officially the most southern place in the world I have visited thus far in my life, I saw an employee at the bus terminal using crutches because his feet had grown backwards but bless him for working and the terminal for hiring him. The other volunteer and I arrived in Asuncion at 4:30am and found rooms at a beautiful new hostel downtown. I was so excited for a hot shower. We filled the day with errands at the Peace Corps office, lunch of great Chinese food, a friendly and random chance meeting on the sidewalk with an alchemist who gave us mounds of fresh fruit from his home, and catching up with a Paraguay friend, Ernesto, who lives and owns a leather goods shop in Mercado 4 and who took time away from the business to show us around. He’s super sweet. We treated ourselves to massages and headed back to the hostel where we met a Russian-German man who speaks 8 languages, has lived in Brazil a number of years and moved to PY only two weeks ago. This is what I love about hostels. You meet interesting people. We were joined by another volunteer friend and sat around sharing stories into the night. 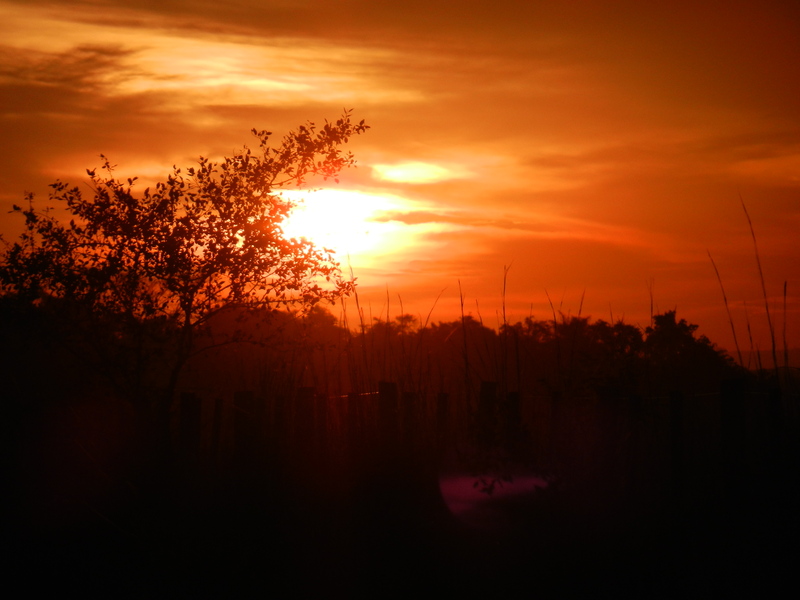 The next morning I was refreshed and ready to rejoin my community. In a cab ride back to the bus terminal we were surprised to find ourselves in a new car in mint condition complete with new-car smell and lace seat covers….a rarity in PY, or anywhere for that matter! My host Mom, Isabel, and I were chatting recently about food. She confessed that PY doesn’t have much in the way of food preparation education. Recipes and cookbooks in the campo are rare. Most recipes are passed on by family, hence why one family’s sopa may be very different from another’s. She added that many women in our community are eager to learn how to prepare healthier food and lose weight but don’t know how. I see some nutrition workshops and cooking classes in our future! This last week of January has been packed with bee projects from which I finally obtained my own hive of bees. Having this work has greatly improved my overall satisfaction and minimized the normal ups and downs, at least for now. 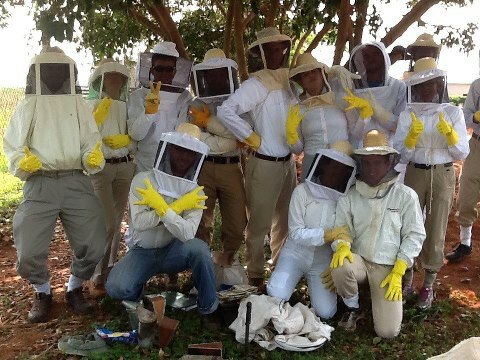 It feels good to have solid work and make a tangible contribution through beekeeping for those families. Most bees here are Africanized or the infamous “killer bees.” I did three wild-hive captures (trasiegos) with various members of my community and a honey harvest with my host family. Now that my community knows I can help them with bees, invitations keep pouring in from families wanting help and folks are eager to tell me where to find the next takuru (termite mound). Let me clarify: invitations come from families with whom I’ve built relationships. Like most places in the world, nothing is accomplished here without first building relationships (and building toward your “Three Cups of Tea” as it were). And even the most pressing matter may still take a backseat to first sharing terere with a circle of family or friends. A simple walk down the street always involves saying hello to everyone and asking about their family. A trasiego involves moving the bees from their wild hive and putting them into a wooden hive that is managed by the family on their property. Wild hives are often found here under termite mounds, in coco trees or in holes in the soil. Often you can also harvest some honey during a trasiego, depending on the time of year. We are nearing the end of honey harvest season but were able to collect some honey in all three cases. Bees tend to be much more tranquilo during a trasiego than during a honey harvest because in a trasiego you are destroying their home, they are confused and go into survival mode rather than their typical defensive mode when you simply steal their honey. This is not to say they won’t sting because they will but overall they’re much more tranquilo. In fact, we often handle them with bare hands while scooping them from the wild hive into their new box! It’s incredible how much heat they produce in the depths of the hive and the vibration of their wings on your hands is amazing and, at first, quite unsettling. The first trasiego was a subterranean colony living under a termite mound on the prairie. I had three volunteers who visited for the weekend to help and get additional practice for themselves. The family didn’t originally want to participate at all, the husband citing an ‘allergy’ to bee stings (I think every man in my village conveniently has an ‘allergy’ to bee stings). But ultimately the entire family was an integral part of the process, from rebuilding an old wooden hive to sewing honeycomb onto the frames of the new hive and scooping bees into their new home. Even the teenage boys came up close and helped with the smokers to keep the bees calm. The family was very proud of themselves and their new hive in the end. The second trasiego was the first on my own and I felt pretty confident. I worked with two ladies in their 50s, their first trasiego each. Again, neither wanted to be hands-on originally but, with a littIe convincing, they were cracking open the fallen coco tree with a machete, sewing comb onto the frames, keeping the smokers going and the bees calm, and learning the difference between cells containing honey, pollen and baby bees. In fact, we witnessed three ‘newborn’ bees hatching from their cells that day. Incredible because they come out fully grown, walking perfectly and ready to work. When we pulled a pristine, three foot chunk of honeycomb from the tree we all smiled and posed for a photo taken by one of my host family’s daughters, standing a ‘safe’ distance away in the brush. They realized handling bees was actually quite fun and finished with a new sense of confidence and accomplishment. Personally, I find working with bees very meditative because you can’t think of anything else when you are with them. The final trasiego was another, huge, termite mound on the prairie. A neighbor had planned to harvest the honey and invited me to keep the bees for myself afterward. Score. The final piece of a trasiego after putting them in the box is to leave the box there for a day or two so the bees who aren’t yet inside will find their way there and you take as many from the old hive as possible. Then the following night after dark you move the hive to its permanent location on your own property. Since I don’t have a property my host family offered a spot in the forest on their property for my new bees to live. The problem with this hive is that the days were so hot the bees wouldn’t stay in the box so we could move them off the prairie to their new home. Instead they were clustering outside and underneath to stay cool. So we got up at 5am the third morning and took what we could. Wrapping the hive in a sheet to prevent escapees and stings, we trekked the bumpy mile across the prairie and crop fields to their new location. As we put the box in place, we could hear the angry buzzing of 40,000 pissed off bees now loaded for bear from being so rudely jostled and awakened so we quickly removed the sheet and ran like hell. It was a fantastic week and the unanticipated benefit of this work is that my villagers insist I take home some honey for helping them. I’ve been trying to move my bin of California red worms from the old volunteer’s house to the school garden for lessons in using worms for composting when the school year begins later this month. It took two attempts as the first try was thwarted by fire ants. I heard them before I saw them. I looked up at the sound of rustling thinking a horse or cow was moving through the bushes nearby. Initially I saw nothing but then the leaves on the ground started moving and I realized an army of fire ants was headed straight for us. Because ants don’t like wet conditions, we made a temporary barrier by emptying two buckets of water around the area but it wasn’t enough to stop them. We fled and finished the following week. During that attempt, the 10-year old from my host family told me to stop and listen to the birds. They were really squawking and she told me it was because a snake (serpiente) was near. With this newsflash I just wanted to finish the damn project and get outta there. I cursed myself for forgetting my machete this day. We worked faster, walked carefully and were glad to finish after a few trips with the wheelbarrow. Pay mind to the birds’ song for they speak when the serpent is near. Speaking of insects and dryness, we’ve been hit with a sudden onslaught of new insects who either prefer the dry conditions or are looking for water as desperately as everything else. Many of these insects are stinger types like wasps, clinging to wet laundry on the line and sucking the moisture from it. It’s “carnaval” season in PY. There are two types of carnaval. One is the infamous fiesta scene such as that in Encarnacion and Asuncion with fireworks, festivities, and scantily-clad dancers donning heels and plumage like a Victoria’s Secret runway model. The other meaning for carnaval is ‘water fight!’ haha Isabel encourages me to carnaval her daughters, normally Irma, when they joke with me. The other day the family was on the patio chatting away and I snuck up behind Irma after she’d given me a ration of joking and gave her a good squirt with my water bottle. Water fight and peals of laughter ensued! February 12 is my site presentation which means my supervisor and our technical guru will visit my site to meet with my villagers, explain Peace Corps, my background, expectations the village should have of me and Peace Corps has of my village to support me. During this time, they also inspect my future living space: a classroom in an old, unused school building. I love my host family but can’t wait to move, have my own space, and make my own food again! I’m busy finishing my family visits and ensuring everyone has an invitation to the gathering. Recently my family made chipa, a very popular bread made of corn and mandioca flour and usually shaped like a bagel or baguette. We enjoyed a breakfast of chipa and hot chocolate in the coolness and sunrise of one early morning. This reminded me of the croissants and delicious hot chocolate I had years ago in a tiny French café while chaperoning my daughter’s eighth grade class in Quebec City. I recently finished reading “Water for Elephants” by Sara Gruen (couldn’t put it down and read it in one day) and “Three Cups of Tea” by Greg Mortenson and David Oliver Relin. “Three Cups” portrays Greg’s life as a mountain climber who went on to build schools for children in the Himalayan mountains of Pakistan and Afghanistan. If you’re a climber, interested in other cultures and/or the politics pre-and-post- 9/11 of Pakistan and Afghanistan this one might peak your interest. Next is the sequel to “Three Cups” called “Stones into School” which I am liking even better. “Air tissue” is a popular practice here. Plus it helps with trash management. I’ve never seen a Paraguayan use a paper tissue. It is common for Paraguayans to cook meals in a single pot. This is why stews or “caldo” is so popular. It is also very common for vegetables and meat to be cut into tiny pieces. Fewer pans, less clean up, faster cooking and thus less fuel used. One day at the bus stop I met a woman with 14 siblings, 11 of whom were living. But she doesn’t take the record. Last week I met someone whose cousin had 17 kids and none were twins! On my walk home from the bus one day, courtesy of a fantastic view of the prairie, I counted the smoke from 11 prairie fires. Our normally cloudless, bright blue sky was hazy for the next couple days. Everything is dangerously dry from the drought. 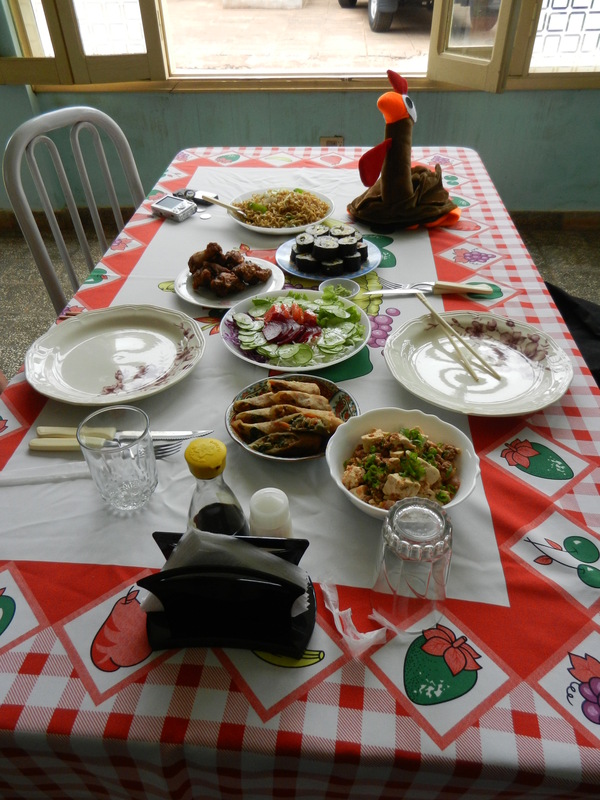 When you visit a Paraguayan family, their hospitality second to none, they always end the visit asking when you will visit again. At first, I just thought they enjoyed the visit and wanted me to come back. Later I realized it’s what they all say to conclude a visit. Haha! Condiments here like mayo and ketchup are sold in small, single serve squeezable pouches, convenient for those who have no refrigeration. Spices are sold in small plastic sleeves but I’m not sure why this convention is popular. Perhaps to be used more rapidly to prevent insect infestation? I remember while working for Hannaford that our Latino populations in the US prefer the same type of spice packaging over the flip-top or screw-top canister style with which I grew up. Don’t forget to tell your favorites that you love them. Today’s quote is a good reminder that generosity need not be acknowledged in order to be worthy. And, with the holidays upon us, there is a bounty of opportunity for such giving that will warm you all over. For me personally, some of my most satisfying moments are those deeds I’ve done or gifts I’ve given anonymously and for which I can never be thanked. It helps ground me in knowing I am giving from my heart, not for the recognition. In thinking about content for this post, I had decided to write a piece on appreciation for my adventures on the micro (public bus, aka ‘collectivo’), which have been many and positive or at least humorous. However, after yesterday’s ride home, my experience took on a whole new level. The micro has an amazing capacity to expand itself. Invisible to the eye, a bus already bursting at the seams and seemingly impossible to accept a single additional passenger somehow continues to stop for passengers and manages to squeeze them in (not one, but 15-20 more). At one point I counted 9 of us on 2 stairs at the rear exit, hanging out the door. Riding the stairs is a major safety no-no but it was a better option than taking a bus after dark. After 10 minutes I worked my way 2 feet inside the door, into a pressing mass of hot, sweaty bodies and lingering diesel exhaust. Freshness was not a term that could be used today. Despite all windows being open, ventilation scored a zero in the aisle, an aisle made for 2 abreast but currently accommodating 3. We were grateful for oncoming traffic to refresh our air supply (perhaps more accurately stated as reorganizing diesel exhaust, BO, and carbon dioxide) and I was secretly praising whichever hombre it was who remembered his aftershave this morning. Last Friday I practiced my juggling again and almost got it. Getting closer. But I did learn to build a solar dryer to make dried fruits, veggies and meat jerky. I’ll need it to preserve all the mangoes (dry mango slices anyone?) from the trees at my new house! Coolest thing of the week. Well, until I helped capture a wild bee colony a few days later. That was TOP SHELF. These bees, called Africanized bees, are typically much more aggressive than those we have in the states when you work them in a hive but I learned that when you are capturing them from inside a coconut tree and giving them a new home, they are much more tranquilo. There were hardly any stings in the group despite me cupping them into my hands from the tree and moving them into the new box hive. This is only my 3rd time working with bees in my life and I can’t believe how much more relaxed I am with them now. I was able to take off my gloves and touch them with my bare hands. So cool to be just me and the bees, checking each other out. The feeling of bees covering your skin and the vibration of their wings is nothing short of incredulous. It has become somewhat of a meditative experience and I’m very much looking forward to helping my host family harvest some honey when I’m at my new site. The bonus is snagging and eating honeycomb/honey/pollen that was warmed to hotness by the sun. OMG. I think it’s my new favorite thing. If I were a bear, I would try and steal it too. Thought for the day: If you feel like you have a bug on you, you probably do. Back home the sensation of a spider crawling along my arm or stomach was always just a long strand of hair falling loose down my arm or into my shirt. In PY, my hair is now longer than it’s been since my daughter was little and the sensation of a bug crawling on me is greater than ever…. Oh wait, that’s because it usually IS a bug crawling on me…. Yeah, like the other night. I was lying in bed, updating my journal by flashlight, having gotten fairly used to the feel of my hair blowing on my arms from the fan. Suddenly something was definitely crawling on my skin. The flashlight revealed a small spider on my arm. I quickly squished it and went back to writing. Before long, same thing on the other arm, then another and another. By now, I’ve got my glasses on, flashlight in hand, out of bed, and striding for the overhead light to see WTF is going on. I had dozens, yes dozens, of small spiders in the bed – even though I had done my thorough nightly ‘tween the sheets check and found nothing. And they were crawling all over my headboard, sheets and blanket. Eeeeeewwwww. Fortunately, they were small and easily squishable but, at 11pm, I just wanted to sleep. Once I’d calmed down about the spiders, I finished re-tucking the sheets and blankets tightly around the bed and turned around in time to spot a baby lizard (gecko?) flash across the floor toward my shoes. Sigh. They don’t bite do they? And the baby spiders are too small to bite. Right? Yeah, that’s what I’ll tell myself. And of course, I left my mosquito net in my new community (one less thing to carry on moving day) but it would have offered some semblance of protection. At least in my mind. At this point, I was too tired to care. The thought of spiders or geckos crawling over my face at night, like a lot of things…. I just can’t think about it. Oh yeah, and this happened twice in 3 days. I’d be lying if I inserted a ‘Tranquilo’ here. Lol. Last Friday was a celebration in training: all exams are done and our fellow trainees and professors teamed up to offer fun classes, one of which was salsa dancing. While you know tango is where my heart is, we had a blast. The music is fun and people were really enjoying themselves. The other cool thing we learned (perfect for the holidays or to spice up your milonga) was how to make a candle from a juicy orange (yes, the fruit). Simply cut the orange in half lengthwise so you’re cutting through the stem end, scoop out the fruit but not the pithy white part. Take a piece cotton and stretch and twist into a tight, thin wick (the tighter it is, the longer it lasts). Coil into bottom of one orange half (you might need to prop up with another piece of cotton for height), then add cooking oil to the orange (vegetable, olive, whatever you have) so cotton is saturated and there is plenty to burn for a while. Light cotton with a match and – voila- you have a candle. To make more interesting, use the other orange half for the ‘top’ and cut a hole or interesting design in the center of it (for ventilation and adornment). Do not let candle run out of oil and center your wick with the hole in the cover so the flame doesn’t burn the orange. Beautiful and smells good too. I don’t know what it is about Paraguay but I, health nut extraordinaire, have craved Coca Cola since arriving in this country. Previously, I’ve had exactly 1 soda in the past 5 years. Since September, I’ve had 1 every other week. Is it the heat? Is my diet lacking? Is it the effectiveness of their marketing everywhere I turn? Is it because I’ve had to relax so many old standards (diet, health, clean air, co-existing with bugs) that it’s become a coping mechanism? (of course, I jest). LoL. Those of you who don’t know me well may wonder why this is newsworthy but, to my family and closest friends, this is simply shocking. I’ve fallen off the wagon. But it could be worse. I could start burning my trash as is customary here. Wait, I’ve already had to do that too. Where is Wendía and what have they done with her??? My host family owns a despensa in the front of their house where they sell many basic necessities like laundry soap, toilet paper, cornmeal, wine (wax cartons of wine and shelf stable juice and milk are very popular here) cheese, and more. Locals simply walk up to the house, clap (instead of knock), and await someone to answer the door. 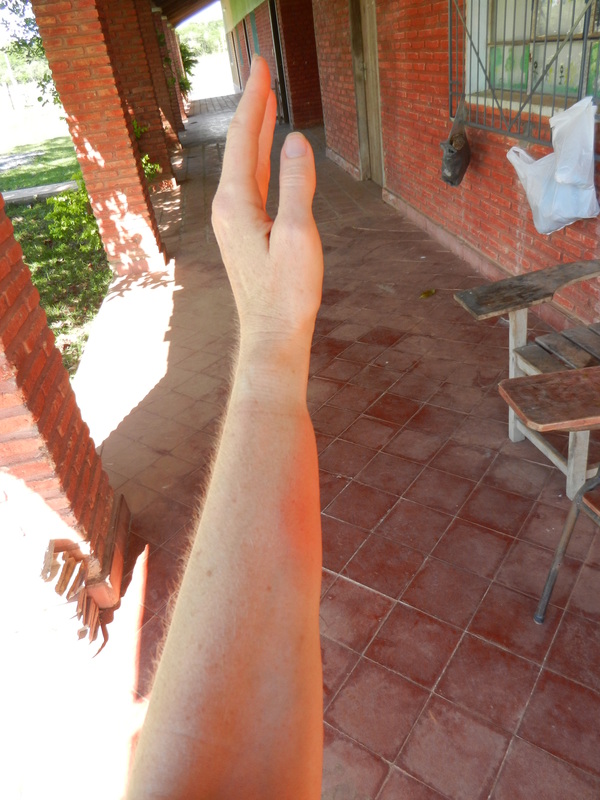 In ‘Paraguayan time’, these things cannot be rushed. Customers do not approach any despensa expecting prompt service. In fact, there is a chair outside the despensa door for customers to sit while they await the Señora. At other despensas I have witnessed 30 minute waits while the Señora finished her breakfast and completed other ‘pressing’ household functions. My family never leaves a customer waiting that long but shortly after my last post where I talked about the infamous term “enseguida” , host Dad used it on a customer who came a-clapping. I answered the door with my “Uno momento, por favor” and went in search of host Dad because often the family is out back tending animals, etc and can’t hear the claps. He was at the kitchen table texting on his cell pone when I mentioned there was a client at the door. “En seguida” was his answer, meaning ‘Ok, I’ll get to it.’ For some people (not my family) this might mean anything from a couple minutes to never. Imagine the reaction this type of service would stir in the States? Wait, actually, sometimes we DO get this kind of service. Hee hee. But people here are totally tranqui about it. Sometimes they don’t want to wait and just leave after a few minutes, no hard feelings, but usually they hang out in the chair until someone is free to tend the store. I wish we had this back home! And the despensas are open at the convenience of the Señora or her family. No one here has regular business hours except bigger stores. Last Saturday, one insistent clapper woke me up at 6am while others come up the walk at 8pm. This past Sunday I, and 4 of my closest fellow trainees (aspirantes), enjoyed a final Sunday luncheon with my host family. I’ve mentioned before that Sunday is family day at my host family’s house. All 7 of the adult kids and their families congregate to make food, converse, laugh, drink terere and enjoy each other. My friends are amazed how well the family gets along and we noted how amazing it is that a family of 20+ people make a priority to be together every week. Nothing else matters. Nothing else takes priority. Sunday with family is sacred. It’s been an honor to witness this and remind myself how lucky I am to also have a wonderful, loving family back home. I very much miss them and will be glad to reconnect when my service is done. However, I am fortunate to feel the spirit of our connection even when we are so far apart. My host family asked me a couple weeks ago if I’d be willing to make my favorite dish from los Estados Unidos (United States or E.E.U.U. for short) for this final meal. Of course, I agreed and they’ve been hyping it up amongst themselves ever since. No pressure! I decided on shepherd’s pie, one of my favorite dishes from childhood…I loved the way my Mom made it. It came out well, they all liked it, and asked for the recipe. However, in the process I discovered why Paraguayans never eat kernelled corn. It is eaten only freshly ground and cooked in sopa or dried and ground for cornmeal. The corn here is not sweet and crunchy like back home. It is very starchy and chewy – more like feed corn for cows. I couldn’t fix the chewiness factor but a little sugar in the cooking process helped bring my recipe one step closer to home. Oh, also, my host brother just returned from vacationing in Buenos Aires and brought me an apron for when I cook in my new community. So thoughtful! Because I am headed to my site in a few days and unsure of my internet access for the foreseeable future, I will leave you with a few more random facts of Paraguay. Enjoy your holiday season, family, and friends. Tranquilo! Paraguay boasts the 3rd largest Peace Corps post in the world, second only to the Ukraine and Phillipines. It also has the lowest crime in the region. 99% of all yogurt is PY is liquid. It is sold in cups like the states but most people drink it instead. I hope to make my own once in my new home. I discovered what we affectionately call the loofa plant: a squash plant that produces a sponge as a fruit. It dries on the vine in a thin shell and looks exactly like a sea sponge though I hear it’s much more durable. Volunteers use these for bathing, dishes, cleaning, etc. I scored a couple seeds from a volunteer and will give it a try. Pictures next year. Or google it. Sugar cane harvest (caña de azúcar or takuare’e) is done and fields are planted with the next crop which takes 2 years to mature. Mandioca (yucca root) is also a 2 year crop but most people begin harvesting slowly at 18 months and finish at 2 years. Mandioca is a staple of the diet here, served boiled and plain with every meal as a starch. If you don’t take a piece of mandioca to eat with your meal they look at you like you must be a french fry short of a Happy Meal. Afterall, who would refuse mandioca with their meal? Duh. This year’s crop is severely short due to last year’s drought (sequia). The passionfruit and mango harvests are just about to begin. Heading for the bus I scored a fresh mango today as one dropped right behind me. YAY! 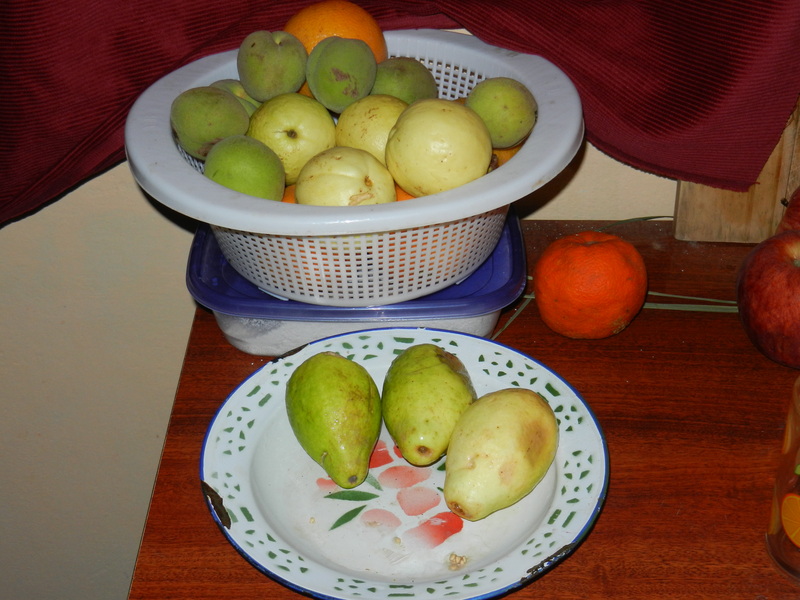 The mango trees are laden and drooping, ready to yield their fruit, like a heavy wet snow bends the pines back home. Volleyball (volei) is very popular here, second only to futbol (soccer). A favorite paraguayan snack is the empanada. You cannot take a bus to Asuncion without consuming at least two. Corn is currently waist to shoulder height in most places. Sweet potatoes are much sweeter and more moist than in the states. Deep purplish brown on the outside, white on the inside. I love them. The most popular vehicle brands here are largely due to their low purchase price for already-tight budgets (in no particular order): Nissan, Datsun (remember those? ), Mitsubishi, Kia, Hyundai, and somehow also Mercedes (mostly for trucks). More popular than any car or truck is the infamous moto, of course. It seems everything is opposite South of the equator: the seasons, the way the wáter circles down the drain and the way people keep their animals. Paraguayans fence animals OUT and houses, gardens, and trees IN. In my new site, all the livestock are free-ranged, grazing randomly throughout the community by day, returning to the futbol field at dusk. Neighbors graze their animals together as well. I graze my horses, cows, goats, and pigs with yours. They are free to cross the road, lay down and block traffic, and often raid your garden if your fence is insufficient to keep out the strong, curious and hungry. If they get into your garden, it’s your fault, not theirs. You shoulda made a better fence. I have found the national pólice to be very friendly. They are everywhere and helpful when you need directions to the baño. Perhaps because they drink terere on the job. It’s a pretty funny sight watching pólice drink terere under the shadeof a mango while on duty. Tranquilo. Don’t wait for tomorrow to follow your heart. Even if the journey cannot be completed today, small steps are possible every day. Before you know it, you’ll be there. Poco un poco. 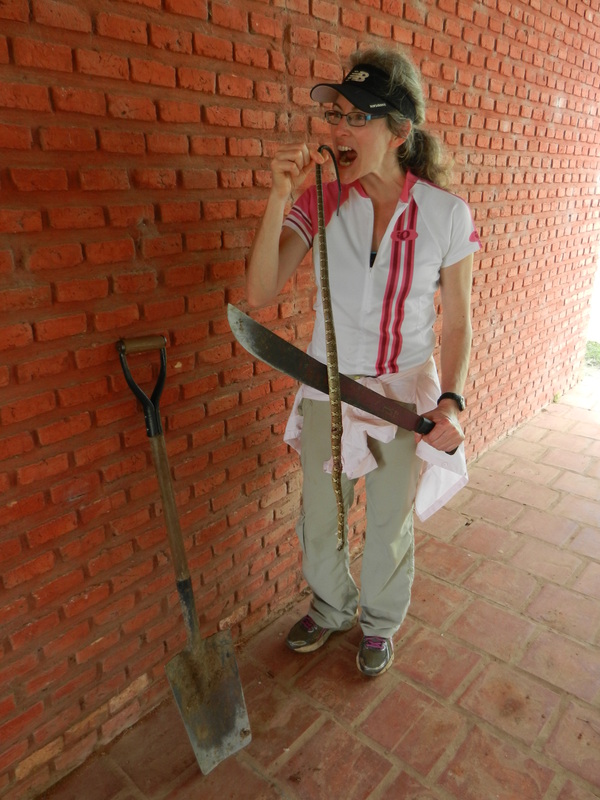 Paraguay has not disappointed me in my ongoing quest for adventure. This morning, after a 6-hour tempest of rain, hail, wind, and more in the hours leading up to, and including, my journey to the bus stop my road was literally… a river. I was wet as soon as I stepped from the porch. Our normally-dry driveway had turned into an angry brook. Quickly realizing I would spend the day with wet feet despite my rubber boots and best intentions, I sloshed my way toward the road leading toward the bus stop. What was normally a 30 foot wide, grassy shoulder was underwater, forcing me into the road, deserted save for the occasional public bus and moto drivers taking their chances. Here schools close when it rains (not kidding), but not Peace Corps training! I made my way to the Cruce (a crossroad with a bus stop and despensa) through ankle-deep water, torrential rain, lightning and booming thunder with my backpack of lunch and books snuggled cozily under my raincoat. Instead of the regular soft, dry red dirt road I found a roaring red river. It had rapids, it carried discarded Coke bottles to new destinations, and, with a current strong enough to pull my feet from under me, was impassable. .. perfect day for a kayak, if only I’d had one! A look around provided today’s architecture award in what mimicked the Mississippi Delta pumping silt into the road, producing a striking fanlike arrangement on the pavement. Of all days, I wish I’d had a camera. It was perhaps the most interesting scenery of all my four weeks here. Power, destruction, beauty: nature rearranging itself. The day quickly turned beautiful – blue sky, hot, humid, and oppressive. We have a saying in Maine: “If you don’t like the weather, wait a minute”. I think Paraguay has Maine beat. It, too, provides weather extremes in a single day and makes planning a day-long excursion worthy of a Girl Scout badge. Always be prepared. We toured a government-run agricultural operation in Ca’acupe that offers services similar to the US Cooperative Extension. 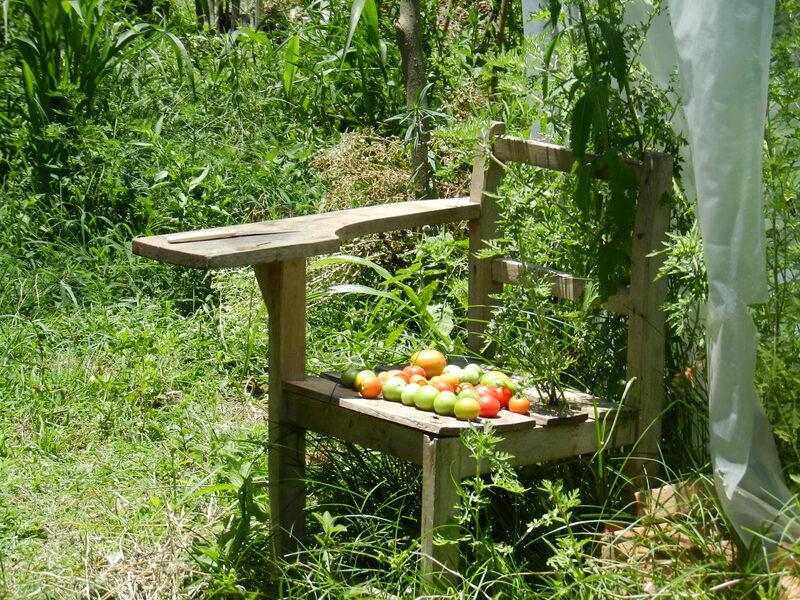 They test varieties of tomatoes, melons, potatoes, and garlic and are currently growing macadamia nuts! Did you know that garlic doesn’t grow well in Paraguay because the heat is too intense and it prefers more hours of daylight than found here? As part of my training each person recently had to research a type of Abonos Verdes (green manure/cover crop). A classmate outdid himself by composing a rap on Kumanda Yvyra’i (ku-man-DA u-vra-E)—similar to a black bean–, in Spanish, perfectly rhymed, making complete sense and absolutely hysterical. If he ever gets it on YouTube I will share. Never dreamed an Abono Verde could be so funny. There is no shortage of entertainment in my group of trainees. This week was the ultimate combination of intensely taxing and extremely rewarding. Working in the kokue this week I paused and took inventory: I felt both exhausted yet fully, exuberantly alive, aware of the slip of my shoes against my bare feet, the sun warming my arms, the dry clay soil desiccating my hands, each nerve cell in my body like mini antennae, soaking up every sensation, my heart full of appreciation and gratitude that I am here as well as sadness that my Grandma is quickly slipping away and I can’t be with her. 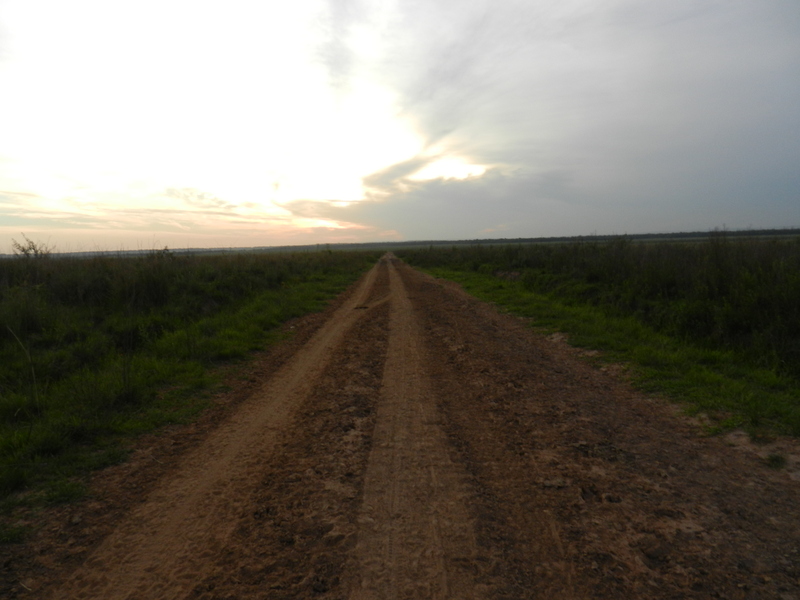 I looked across the road and admired the vista: miles of Paraguay, campo, and Argentina in the distance. Tranquilo.